Head offshore in pursuit of wildlife upon some of the most unspoiled waters off southern California. seals, sea lions, dolphin and porpoise as they travel through or spend time feeding in the deep submarine canyons located off San Diego. 25% OFF Whale Watching - Use code "WhaleSale25!" Offshore from San Diego, we observe these majestic creatures in their natural habitat while heading south to the calving lagoons of Baja Mexico. During the north bound migration in the spring, we observe mother and calf pairs as well as mating pods. 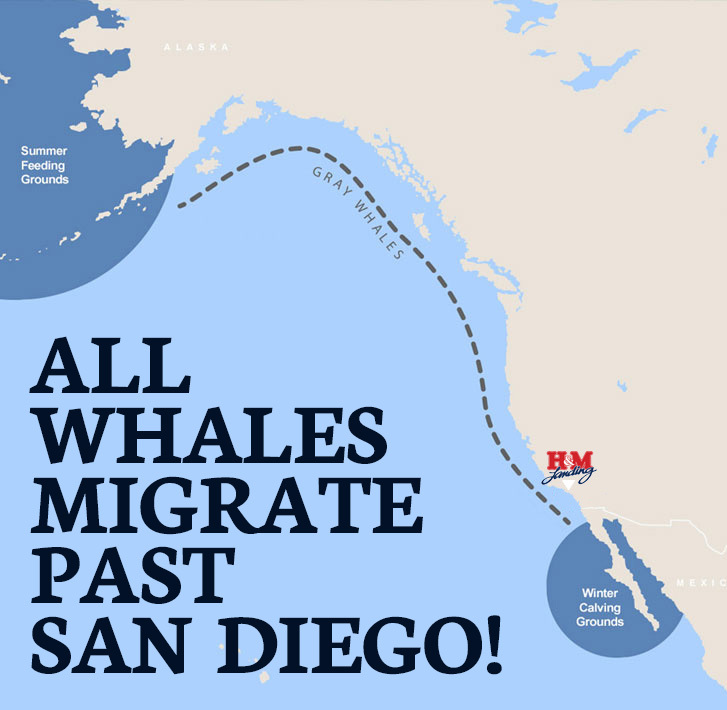 H&M LANDING has long been the pioneer in West Coast whale watching since 1953. Renowned for our wide range of adventure offerings, we have unsurpassed expertise in the approach and observation of marine wildlife in their natural environment. Unlike the San Diego Zoo, Sea World or the San Diego Wild Animal Park, we have the unique opportunity to observe nature as it was intended, unspoiled and on its own terms. Whether you are looking for a 3 Hour Local Trip or one of our longer expeditions to the seacoasts and lagoons of Baja California, H&M Landing will show you the way. Whale Watching at H&M Landing is at H&M Landing. Whale Watching at H&M Landing shared a link. Day at the Docks is next Sunday, April 14th. Join us for this celebration of San Diego Sportfishing where you can enjoy open house tours of vessels in the fleet. displays and deals from leading tackle manufacturers, seminars, casting contests, boat rides, entertainment, raffles and even a stocked fishing area for children. Festivities go from 9 AM to 5 PM. See You There! With a passion for ocean adventure, a love of sport fishing, and a desire to share such experiences with all, the Mascot II departed from a dock at the foot of Broadway in downtown San Diego and H&M Landing was born. Since 1935 H&M Landing has been the West Coast leader in Sportfishing and SeaFari Adventures. Thank you to all for your support and adventuring with us! You are part of a proud tradition and we look forward to welcoming you aboard for many more years to come! Whale Watching at H&M Landing shared a post.